Elect to perform geometry building, which will attempt to heal the inaccuracies in the model being healed. 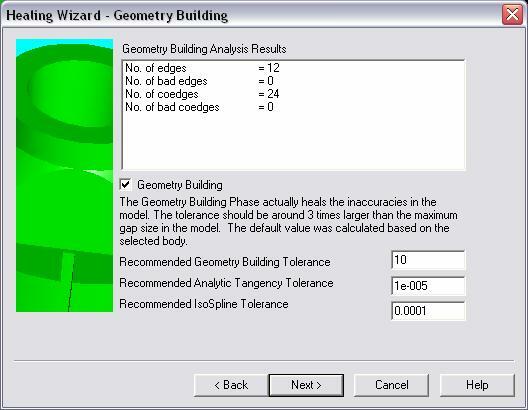 Geometry Building Tolerance is the tolerance that drives the actual geometry building of the model. This should typically be slightly more (around 3 times) than the maximum gap size in the model. The maximum gap size calculated during stitching is used as the geometry building tolerance for automatic healing (autoheal). However, you may need to increase the geometry building tolerance if the healed geometry deviates substantially from the original geometry. Analytic Tangency Tolerance is the tolerance that fixes tangency constraints in the model when the analytic solver attempts to heal all edges and vertices shared by analytic surfaces. The default value of 0.01 permits translations of .01 to be performed to surfaces. Isospline Tolerance is a positional tolerance that gives the upper bound for movement control points of splines during healing. The default value is 0.01 for a reasonably large spline.